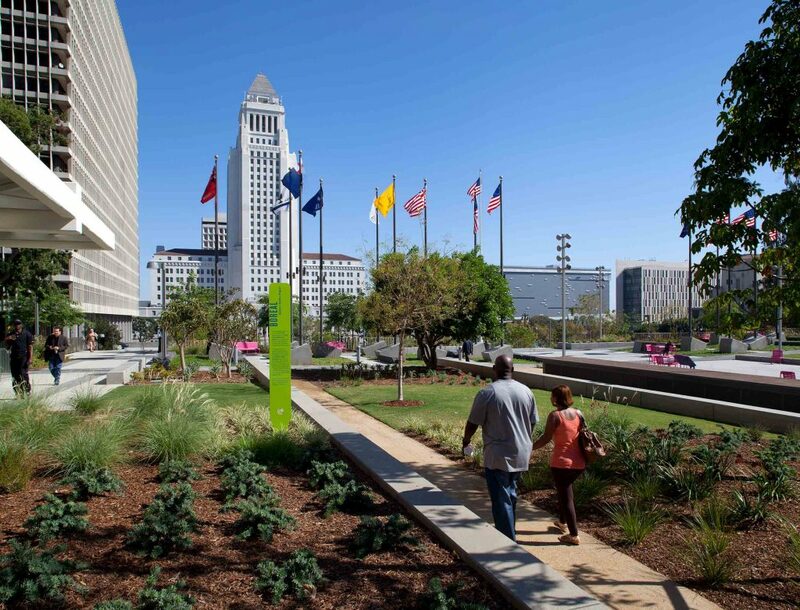 The design of Grand Park has no smaller aim than to express the multicultural diversity of Los Angeles through landscape design and architecture. 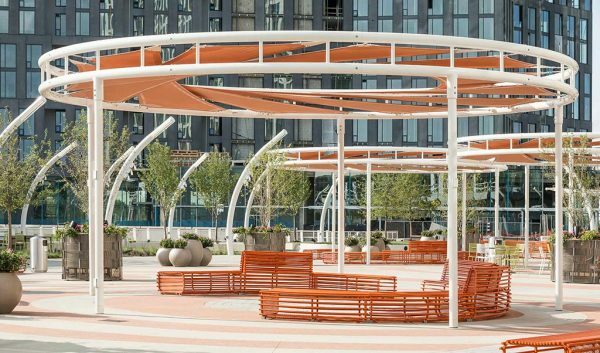 Rios Clementi Hale Studios transformed a 12-acre space filled with parking lots into “The Park for Everyone,” an adaptable community gathering place that has redefined the future of downtown Los Angeles. 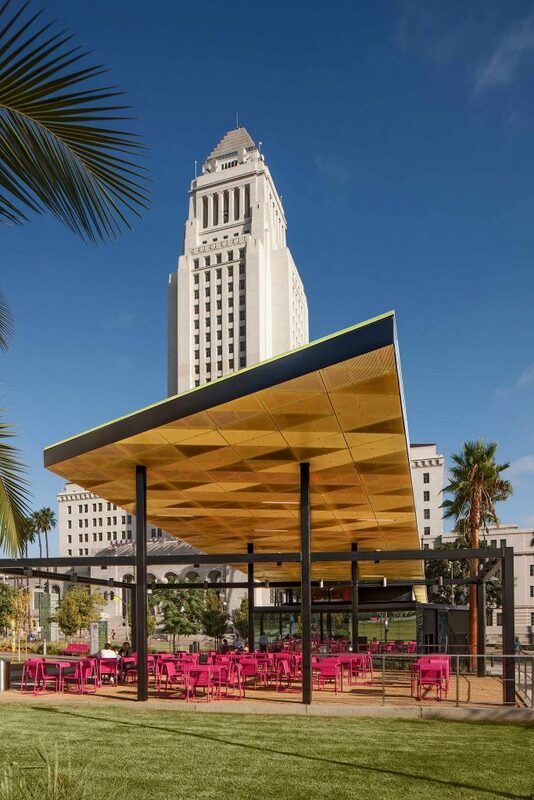 Grand Park creates an important link between important Los Angeles’ buildings and cultural icons — from City Hall, in the heart of downtown, all the way to Grand Avenue, connecting the Park with The Music Center, adjacent Disney Concert Hall, and the Broad Museum. 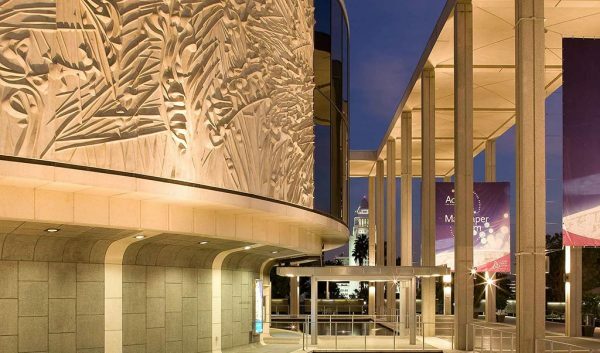 were added to the existing Arthur J. Will Fountain to encourage kids of all ages to jump in with both feet. 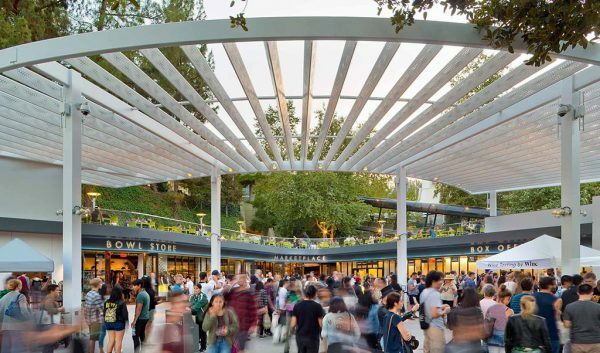 A 92-foot change in elevation between those landmarks was the most challenging aspect of creating a single unifying space. 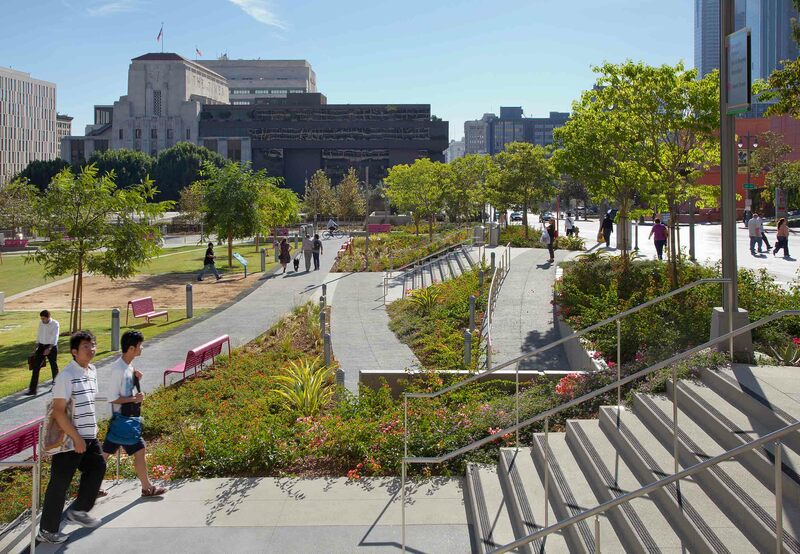 We viewed that as an asset, an opportunity to soften the steep incline with elegant staircases and ramps that make gradual transitions between levels. 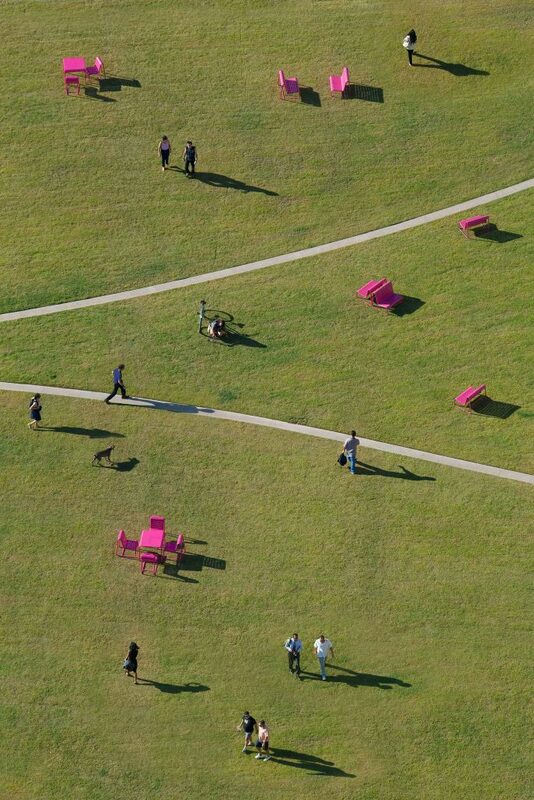 A series of central terraces create reasons to stop along the way, all while concealing infrastructure. 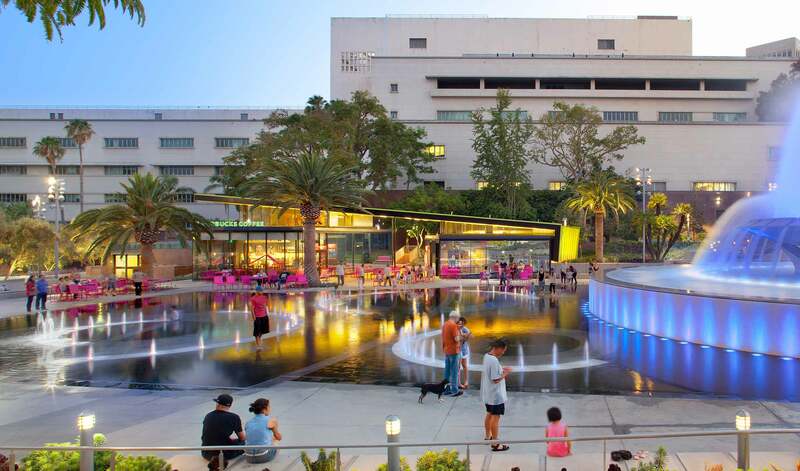 The spaces comprising the entire park are known as Fountain Plaza, Performance Lawn, Community Terrace, and Event Lawn. 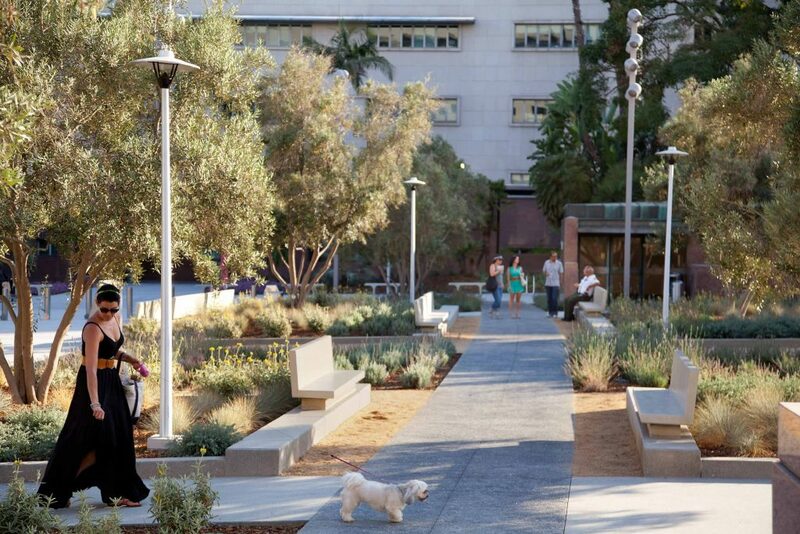 The program features a restored historic fountain and new interactive water feature, new lawns and gardens, a dog run, a playground, and a 2/3-mile pedestrian loop. 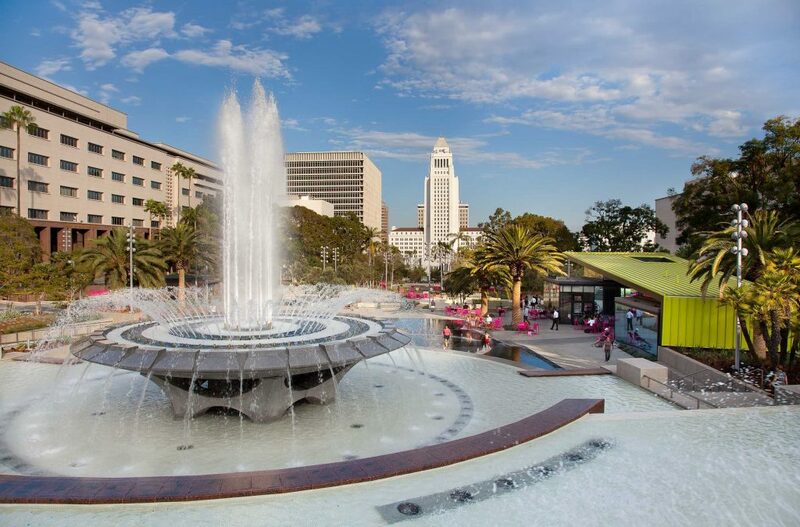 A shallow splash pool and 79 programmable jets, along with colorful kaleidoscopic LED lighting, were added to the existing Arthur J. Will Fountain to encourage kids of all ages to jump in with both feet. 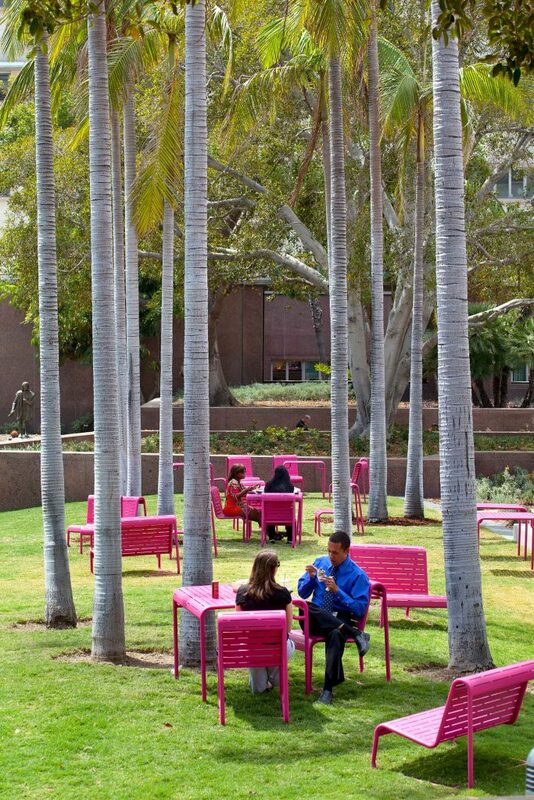 Custom site furniture was designed in a bright magenta that has come be known as “park pink,” playing a large role in defining the park’s identity. 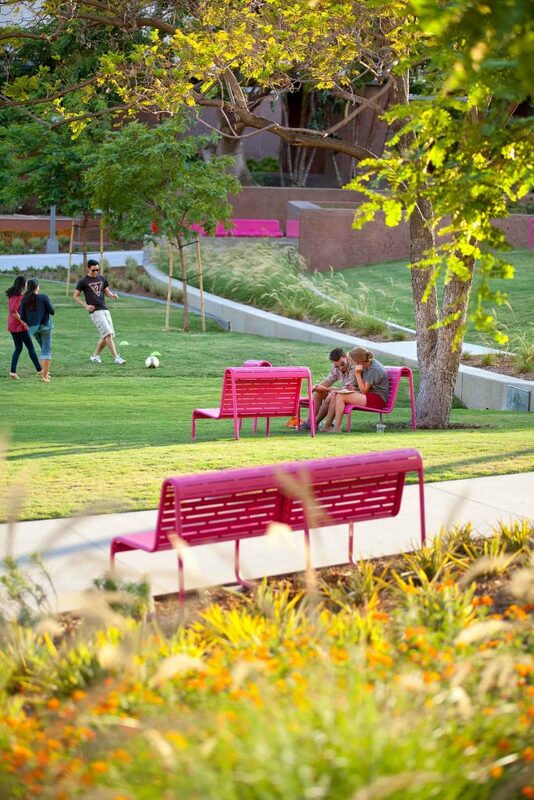 The furniture creates a community Southern California-backyard feeling with the inclusion of 26 freestanding benches, 41 wall-mounted benches, 120 café tables, and 240 café chairs. 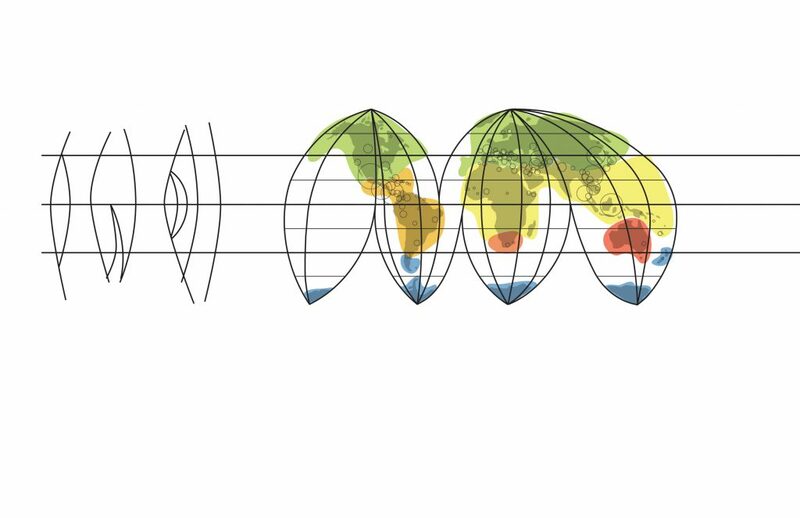 The park’s layout takes inspiration from Goode’s homolosine projection, an innovative mapping process for depicting the three-dimensional world in two dimensions with minimal distortion. 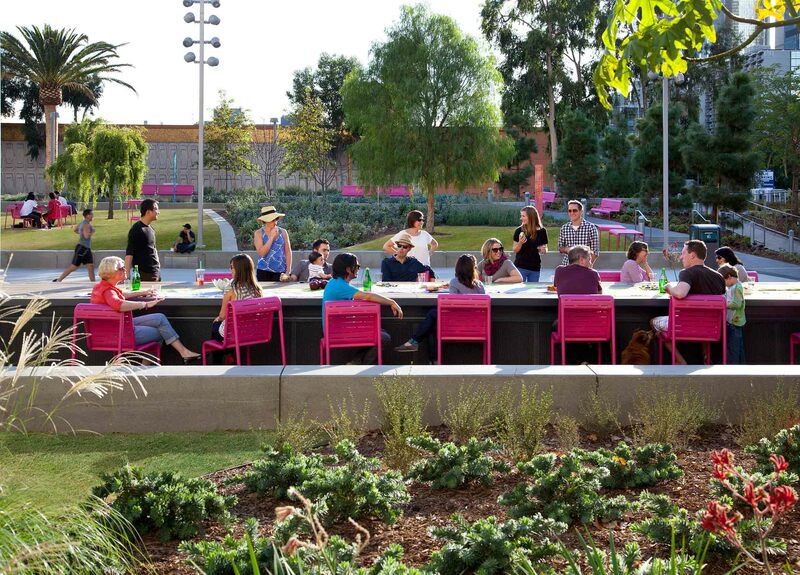 To represent the many cultures that have settled in Los Angeles, Grand Park features species from each of the world’s six floristic kingdoms – Cape, Boreal, Neotropical, Paleotropical, Australian, and Antarctic. 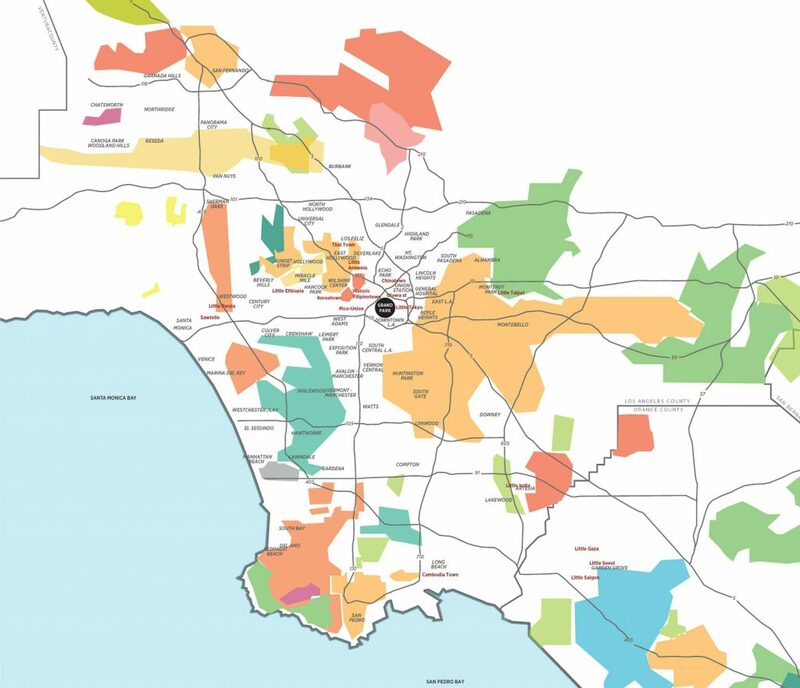 The unique environmental conditions in each of these regions favors different flora, but vegetation from all six kingdoms flourishes in L.A.’s climate of easy adaptation. 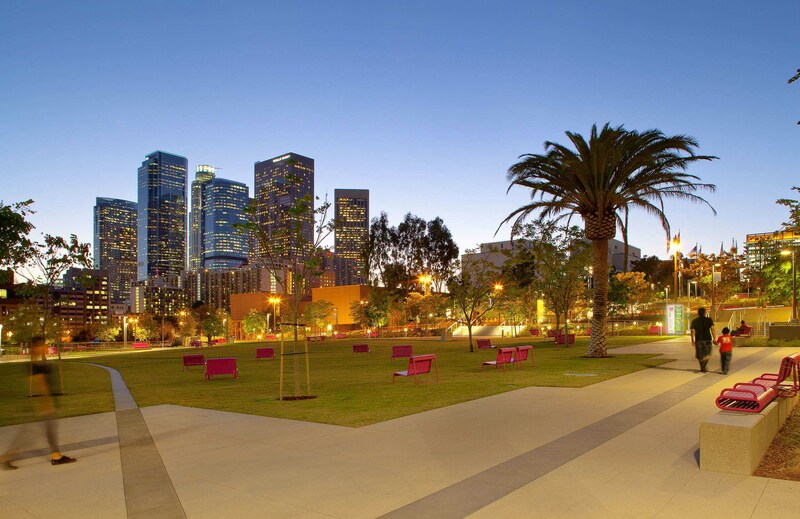 Although Grand Park is a significant marker of the city, it is not a static monument. 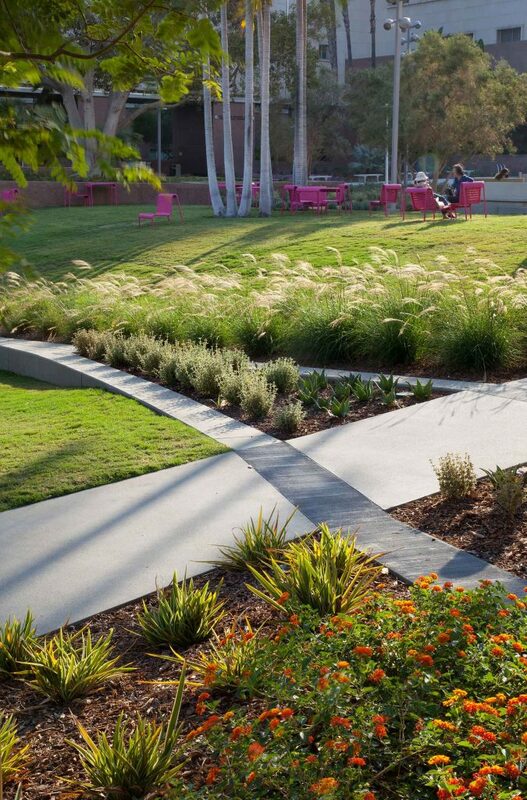 Instead, it acts as the “front- and backyards” for the community, connecting people while representing their diverse backgrounds. 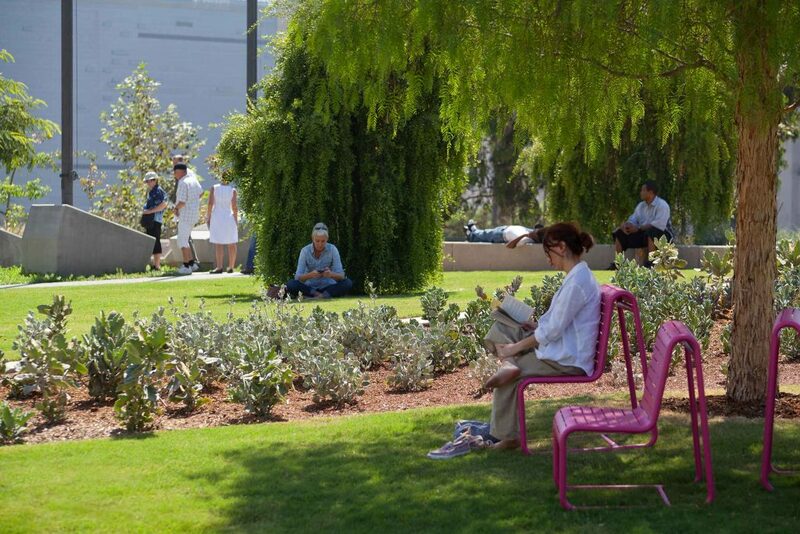 It is a public garden that reclaims a key urban site to celebrate the Los Angeles of yesterday, today, and tomorrow.